The Matthews surge is evident during the final few weeks of the campaign. Now, I am going to read the names of some people. Please tell me whether you have heard of each. IF HEARD OF … Do you have a favorable or unfavorable opinion of ______? 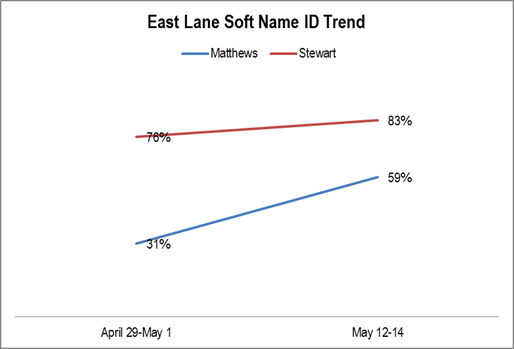 200 live telephone interviews of East Lane County Commission District likely 2014 Primary voters were conducted each of April 29-May 1 and May 12-14, 2014. The margin of error of the survey at the sample median is plus or minus seven percent for each survey. The hard name identification equals the total percentage who have either favorable or unfavorable opinions of someone or something. As before, the Lesley surge during the final few weeks is clear. 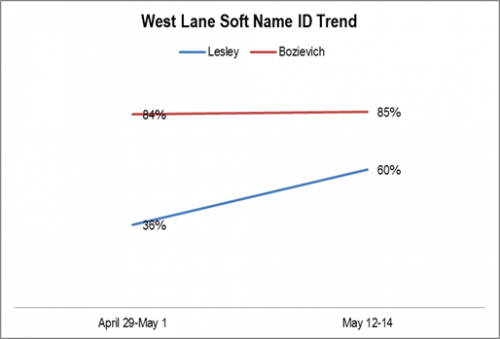 200 live telephone interviews of West Lane County Commission District likely 2014 Primary voters were conducted each of April 29-May 1 and May 12-14, 2014. The margin of error of the survey at the sample median is plus or minus seven percent for each survey. Just as with Lesley, the Matthews campaign surged during the final few weeks of the campaign. The Lesley surge during the final few weeks is clear. 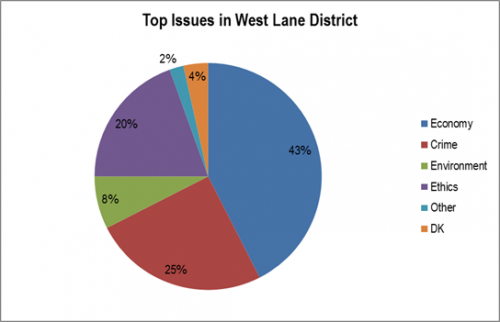 The top issue in the West Lane District is overwhelmingly economic growth with stopping crime and improving ethics in a tie coming next. This is almost identical to East Lane. 200 live telephone interviews of West Lane County Commission District likely 2014 Primary voters were conducted April 29-May 1, 2014. The margin of error of the survey at the sample median is plus or minus seven percent. 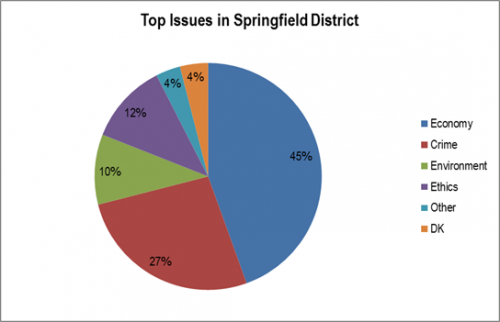 The top issue in the Springfield District is overwhelmingly economic growth with stopping crime coming next. This differs from East Lane and West Lane in that improving ethics is much lower on the priority list. 200 live telephone interviews of Springfield County Commission District likely 2014 Primary voters were conducted April 29-May 1, 2014. The margin of error of the survey at the sample median is plus or minus seven percent. 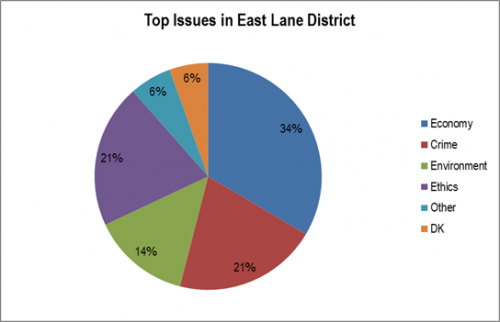 The top issue in the East Lane District is overwhelmingly economic growth with stopping crime and improving ethics in a tie coming next. 200 live telephone interviews of East Lane County Commission District likely 2014 Primary voters were conducted April 29-May 1, 2014. The margin of error of the survey at the sample median is plus or minus seven percent. 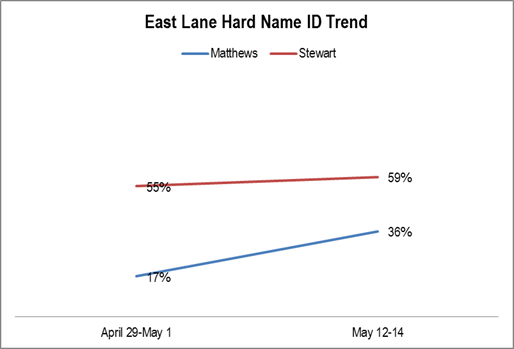 A series of posts will begin today that explore the electorate, campaign time trend, and final election results of the three Lane county commission 2014 Primary campaigns. Again, both campaigns remain true to their game plan. 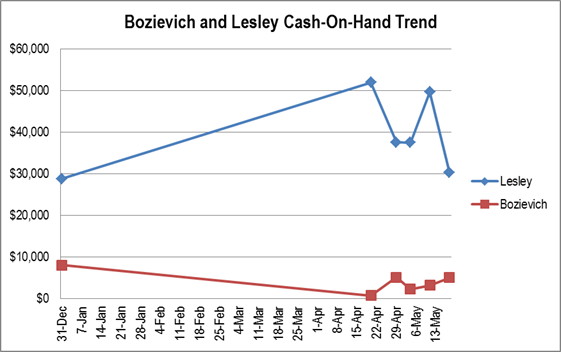 The Lesley cash balance is far above the Bozievich campaigns which has tended not to build up significant reserves. 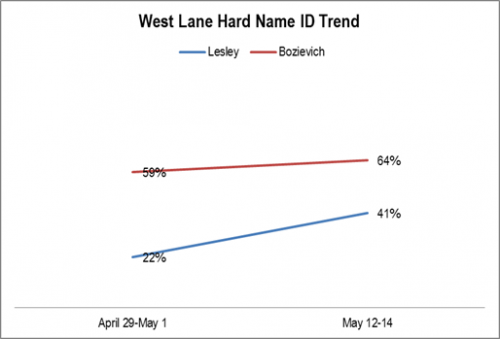 The Lesley campaign is drawing down its reserves as election day, May 20, approaches. Sources: Data collected from ORESTAR approximately noon May 11, 2014. The date cover December 31,2013, April 20, 2014, April 29, 2014, May 4, 2014, May 11, 2014, and May 18, 2014. Note that the campaigns have some leeway regarding when to post information. The latest information from the Bozievich campaign is from May 9 and from the Lesley campaign is May 15. The data are tied to the date of collection not to the date of transaction. 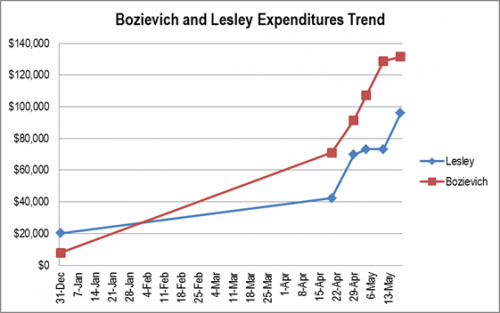 The Bozievich campaign expenditures continue to lead those of the Lesley campaign by quite a bit.